Richard’s love of technology and all things beautiful in the world are the perfect combination for a jeweler. His designs are inspired by many things and eventually are created utilizing the latest design tool technologies for jewelry creation. Intricate details can be defined in 3 dimensions creating a precise model for each creation. The models are cut in wax and cab be presented to the customer for final approval. If you have an idea of what you want, Richard can bring your ideas to fruition. 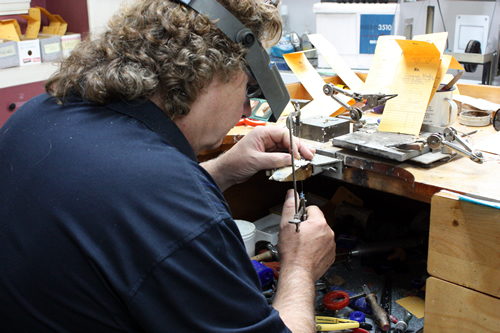 Richard has over 30 years of experience in all facets of goldsmithing, which began in Toronto at the age of 17 working for Birks and Mappins. He eventually worked for a company in Kitchener which move to Moncton and Richard moved there initially to set up the company and provide training. Going out on his own in 1987, Richard spent 20 years running his own jewelery business. Richard loves to create family heirlooms. He is also skilled at restoring antique jewelry. Richard’s jewelry carries a lifetime warranty.